GSDMA, as part of the World Bank funded GEERP, initiated two programs namely Gujarat School Safety Initiative (GSSI) – I & II. The pilot programs were designed for promoting a culture of disaster safety in schools and reduce risk through structural and non-structural measures in the schools. 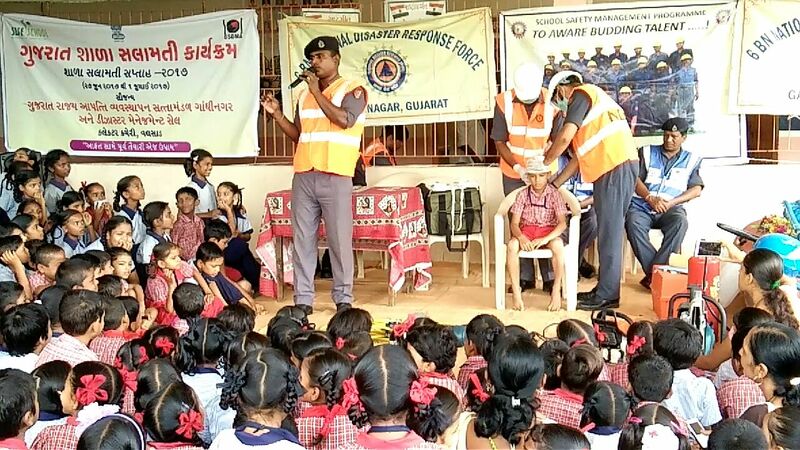 Gujarat School Safety Initiative – I is completed in all the 152 schools, covering training of 1,00,000 students (primary and secondary standards) and 1,500 teachers in the basics of disaster management. School based DM plans were prepared for all the 152 schools. Earthquake drills were conducted in 80 schools attended by around 40,000 students and 640 teachers. As part of the long-term sustainability of the program, an assessment of non-structural mitigation measures was completed and school safety clubs have been opened in all the project schools. A short play on disaster awareness was also organized in 68 schools. This initiative was designed for creation of cadre of master trainers and a pool of trained teachers at district level in disaster risk reduction across all the 25 districts of the State. It was designed for creating a pool of 100 Master Trainers (4 from each district). These master trainers would provide training to 625 teachers (25 from each district). Twenty five model schools were selected & School DM Plans were prepared involving the trained teachers. It was planned that trainings will be conducted for 1,000 teachers and 7,500 students in model schools. In order to achieve the objectives, rollout workshop was held for sensitization of education department officials, district level administrators (District Education Officers & District Primary Education Officers), teachers and students. Eighty six master trainers were trained in 4 regional workshops, 593 teachers were trained throughout the State in 3 day workshops. Twenty five model schools were selected where 25,543 students and 861 teachers have been trained. One model school developed for each district. Methodology for School Safety program has been developed and tested, including templates for developing a School Disaster Management Plan. Training and awareness material has been developed. Also, draft text books for class VII, VIII, IX were prepared incorporating the basics of Disaster Management. Over and above the softer issues highlighted above, GSDMA has provided all the existing Government schools in Gujarat with ISI marked portable Water-CO2 type of Fire Extinguisher (31746 Government schools covered of which 31336 are primary and 410 are secondary and higher secondary schools). For the necessary guidance/instruction for use of fire extinguishers, GSDMA has prepared an 18 minute short education film in Gujarati on fire safety for schools. This was shown to all government primary schools through the satellite network.